Walter Abmayr is from Germany. Organisers of the Okpekpe international 10km Road Race has for the second successive year named world renowned international road race organiser, Walter Abmayr as the Elite Athletes Manager for the 5th edition. This year, the race will hold on Saturday May 13,2017 in Okpekpe near Auchi in Edo State. Like he did last year at the fourth edition of the race, Abmayr will take care of the elite athletes management which includes recruitment, their travel and accommodation in Nigeria. “We are delighted to have Mr Walter Abmayr work with us again on this race which,for the third year running has received international recognition as one of only two road races in the African continent with an IAAF label status,'said Dare Esan, spokesman for the race. Esan also revealed that Abmayr will assist with the technical organisation of the race alongside other officials from Nigeria. “Our objectives for the race are clear and one of them is to continue to have that international recognition and move up to the silver-label ranking. "To do this we decided to re-engage Abmayr whose track record in the technical organisation of road races across the globe and the management of the elite athletes field is second to none. "He is well respected in the sport of athletics, especially road races and has, since 2013 been in-charge of the elite athletes field at the IAAF bronze label LATTELECOM Riga Marathon in Latvia. 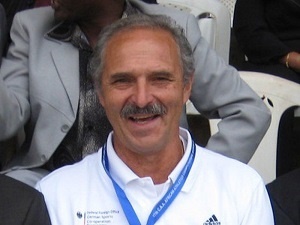 "Mr Abmayr was also in-charge of the technical organisation of the International University 10km Road Race in Heidelberg, Germany from 1987 to 2000 and the gold-label Singapore international marathon (2008-2010)," revealed Esan. The Okpekpe international 10km road race still holds its position as the only road race in Nigeria to receive the prestigious IAAF bronze label award thus confirming the high quality and excellent organizational level.